Lake Shasta is more than just a body of water; there are lots of things to do on and around the lake. If you plan to take a break from boating, fishing, or relaxing, check out these ideas for vacation fun. Lake Shasta is a fisherman’s paradise. From Holiday Harbor’s central location, the best action is minutes away. A fabulous year-round fishery awaits you with these species at their peak times. For those who just can’t give it up, we have an array of enjoyable links in the area. Just 15 minutes south of the lake is Gold Hills Golf Club–6,164 yards winding through the oaks. And if you go north on I-5 to Mt. Shasta, you’ll find one of the best alpine courses in the west. The 40-minute drive is worth it and the view isn’t bad either. See more at www.mtshastaresort.com. Multi-colored fluted columns, magnificent stone draperies in symmetrical folds, and stalactite and stalagmite formations studded with brilliant crystals await you in this wonderful gem on Shasta Lake. Directly across the McCloud Arm from Holiday Harbor and accessible by houseboat, the Caverns offer tours 363 days a year. In the summer, tours operate from 9 a.m. to 4 p.m. on the half hour. In April, May, and September, tours operate from 9 a.m. to 3 p.m. on the hour. For more detailed information, visit: www.lakeshastacaverns.com. The second largest dam in the United States, Shasta Dam, is located about an hour by houseboat from Holiday Harbor. Completed in 1945, Shasta Dam is the highest center overflow dam in the world and is three times higher than Niagara Falls. Free tours through the interior of the dam have again been established at the dam–depending on Alert Status. For tour information and availability, please call 530-275-4463. 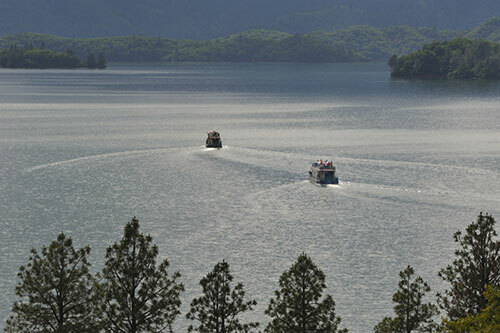 Lake Shasta is noted for sunshine and warm weather for more than half the year. The winters are mild, and spring and fall are delightful with warm days and cool nights.